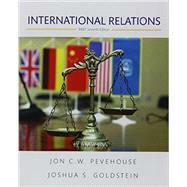 by Pevehouse, Jon C. W.; Goldstein, Joshua S.
MyPoliSciLab for the International Relations course extends learning online to engage students and improve results. Media resources with assignments bring concepts to life, and offer students opportunities to practice applying what they’ve learned. Please note: this version of MyPoliSciLab does not include an eText. Students, if interested in purchasing this title with MyPoliSciLab, ask your instructor for the correct package ISBN and Course ID. Instructors, contact your Pearson representative for more information. International Relations, Brief Seventh Edition is also available via REVEL™ , an interactive learning environment that enables students to read, practice, and study in one continuous experience.